Order for Whiskey from William McFarland to Orange Johnson from the collections of the Worthington Historical Society (WHS) may be used for educational purposes as long as it is not altered in any way and proper credit is given: "Courtesy of the Worthington Historical Society, Worthington, OH." Prior written permission of the WHS is required for any other use of Order for Whiskey from William McFarland to Orange Johnson. Contact WHS at info@worthingtonhistory.org to request permission. Order for Whiskey from William McFarland to Orange Johnson is text, with genre letter and correspondence. Its dimensions are 7.75 in. x 3.13 in.. It was created on Wednesday, August 25, 1824. Worthington Historical Society is the Contributor. Orange Johnson, 1790-1876 is the Addressee. William McFarland is the Author. 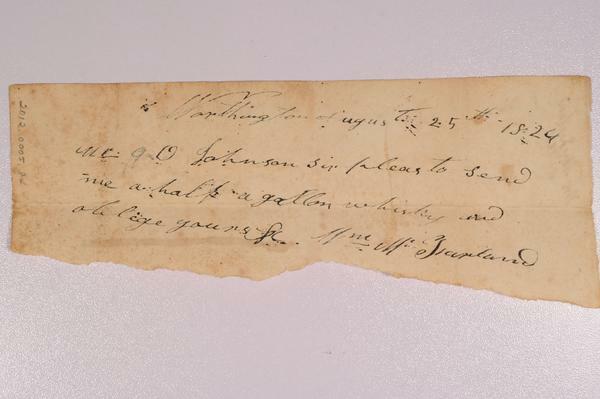 This is an order from William McFarland to Orange Johnson for one gallon of whiskey. Nothing else is known about William McFarland. The Worthington Historical Society identification code is 2012.0005.84. The Worthington Memory identification code is whs0991. This metadata record was human prepared by Worthington Libraries on May 30, 2017. It was last updated November 30, 2017.